Scientists from Dartmouth College in New Hampshire are developing smart fabrics that can detect the presence of hazardous gases as well as protect the wearer from their effects. 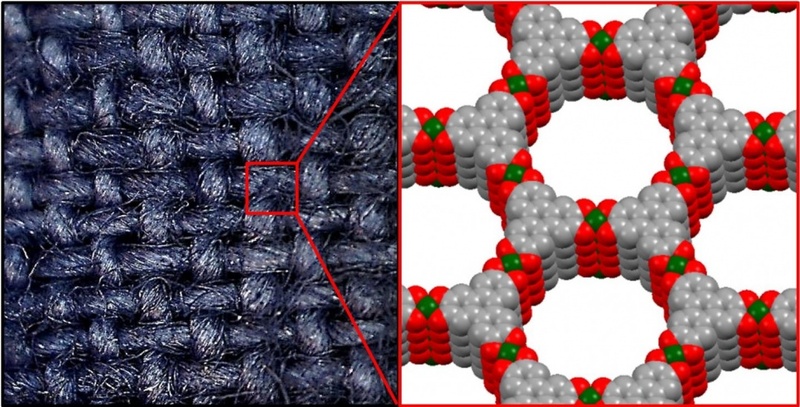 Known as SOFT (Self-Organised Framework on Textiles), the material is flexible and conductive, yet porous and washable. According to the Dartmouth team, the fabric is capable of real-time gas detection. It’s envisaged that the material would be worn by military and emergency services personnel in conjunction with a haz-mat suit, alerting the user to a breach in the primary barrier. “By adding this fabric to a protective suit, sensors can alert the user if a chemical is penetrating the hazardous-material gear,” said Katherine Mirica, an assistant professor of chemistry at Dartmouth College. The smart fabric works by using textile-supported electronic sensors based on materials known as metal-organic frameworks, or MOFs. In their research, published in the Journal of the American Chemical Society, the Dartmouth team showed that the material could identify the exhaust pollutant nitric oxide, as well as the poisonous and corrosive hydrogen sulphide. The researchers claim that the textiles can not only sense these gases, but are also capable of capturing and filtering the dangerous toxins. While the technology requires further development before it can be used in wearable systems, the researchers believe the fabrication method has the potential to be extended into other systems, producing a range of new smart textiles with tunable properties. All that is now required is to add ‘active carbon’ to the matrix (in mini-micron-spherical globules of various size distribution, the basis of what is called the JS-List (Joint (US) Services) suit and the entire toxic potential threat (Nuclear, Biological, Chemical) can be nullified. I do not wish to appear frivolous, but for civilians, the best form of protection against NBC threat is a pair of running shoes. Unless properly trained and regularly exercised, putting on a suit and mask is more likely to cause rather than protect from injury.